Actual deposit is 50% 8 weeks prior to arrival, with the final amount due 2 weeks prior to arrival. Cancelation must occur 2 months prior to arrival otherwise 50% is non refundable if canceled within 2 months. Meeting rooms and amphitheater available. The Yosemite Bug Rustic Mountain Resort is 27 miles from Yosemite Valley. Located on a forested 50-acre hillside complex, the Bug is a magical, relaxed social place with all the amenities. In addition to the guest kitchen, we offer a restaurant that has a great reputation locally for value and fresh foods. We serve from steaks to vegan. 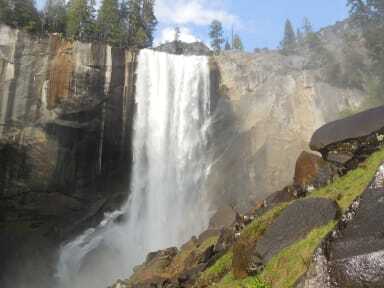 Our Yosemite Health Spa offers hot tub, hot rocks sauna, yoga studio and massage therapies. We also have group accommodations and facilities with packages. Our desk staff and website are well versed about activities and hikes in Yosemite National Park, the Sequoia Tree Groves, and the High Sierra. The Merced River Wild and Scenic Area nearby offers great summer swimming, and whitewater rafting in the spring. Our property has a 1 hour nature trail and a spring swimming hole, ping pong, foosball and other games. There is a 13% lodging tax added on to the balance due. If you are a member of Hosteling International then you will be prompt to show us valid membership upon check in to receive your $3 per night discount, Memberships are available upon check in. If you come by public transit there is a $15% discount. We only charge upon check-in not by reservation and have a 3 day cancellation policy. Bel endroit. Près de la vallée Yosemite. Super hostel rustique en forêt. Cet endroit est paisible et a beaucoup de cachet. Ils ont absolument tout! Cuisine pour les clients, restaurants pour ceux qui n’ont pas envie de cuisinee avec de l’excellente nourriture assez variée pour satisfaire végétariens et vegans et assez abordable. Ils ont aussi le stationnement ainsi que l’option de prendre l’autobus pour se rendre au parc Yosemite. C’est très chaleureux! Ils ont mêmes un endroit pour y faire des feux de camps. J’ai adoré mon expérience! Perfect hostel to do before or after a trip to Yosemite ! Good atmosphere, organic food. The dormitory are well organized and it s more like two bedrooms with six beds and shared bathroom. There s also a spa if you want to relax after long hikes! It s in the middle of the woods so very quiet . The only criticism I can make is the kitchen which is to small for everybody to cook. Other than that a good experience! Hard to be fully positive here. Some good, some bad. Example? Dorms are very nice and the beds are really good. But the heater is turned off after 11PM until the next afternoon. Not really nice when it's below 0°C outside. After a few hours, the dorm was freezing. Other example : the kitchen. A shame compared to other HI Hostels i've been to, not well equiped and without any heating ! Cooking while freezing? I guess they prefer us going to the lodge next door where you pay 10$ for a breakfast. Dommage que le petit dej ne soit pas inclus mais super cafe avec de bons plats à prix raisonnables pour les USA. Hostel à 10min à pied de la station Yarts. Attention aux horaires des bus Yarts (pour ceux qui viennent sans voiture), pas très pratique hors haute saison. Nice place to stay while visiting Yosemite NP. Just keep it mind it takes about an hour of (good) road to get to the park! Kitchen fully furnished and open 24, very convenient with plenty of storage place. Dorms are a bit crowded, but still, a great place if your purpose is to visit the park. 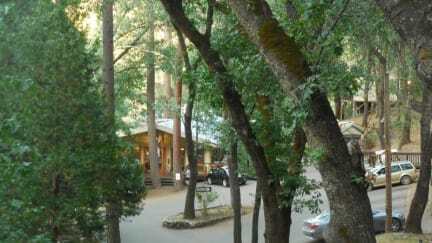 Good hostel near Yosemite, facilities are great and it is in the middle of the forest that's cool. Just be aware that it is far from any restaurant, and the food in the hostel is really good but expensive. Especially the breakfast, really expensive, I recommend you to bring something to have breakfast. Anyway, I recommend it!